I am wondering why it uses E:\ Drive? I don't have an E:\ drive and maybe that's just a virtual drive used by Droid Explorer? 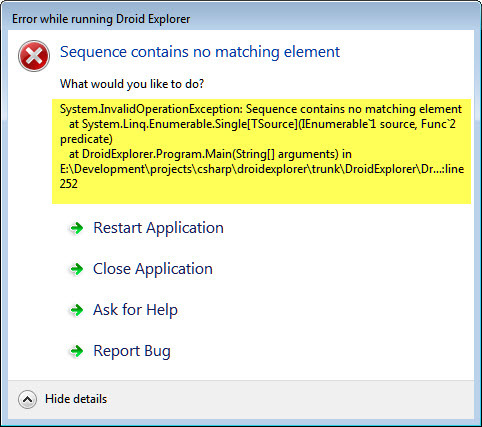 Anyway, after several tries, Droid Explorer 0.9.0.4 now opens correctly but I can't explore any sub-directories. I read the post about it and made sure that I have the correct BusyBox (Stericson) - newest version. It seems the culprit must have been BusyBox. At least after updating BusyBox, it works now fine!